This owl applique provides you with another great decorating option for your previously purchased hooded towel pattern or any other item your imagination leads you to! 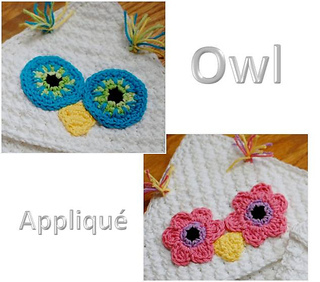 The easy-to-follow pattern includes instructions to make the owl face with two different eye style options. Stitch counts are provided at the end of each row/round, and full color photos are provided for ease of use. Written in American English according to Yarn Council standards and guidelines.